Only, Hasbro doesn’t call it Iron Patriot, since that moniker was already used for another figure released in the first half of the Iron Monger wave. Instead, they went for the Lt. Col. James Rhodes designation, but we all know what suit this really is. 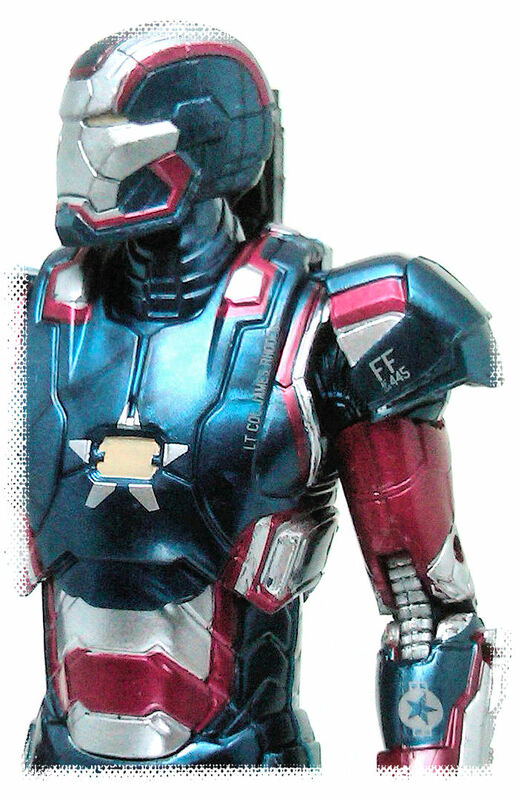 Movie Iron Patriot is a very detailed action figure. Following the new movie aesthetic, the suit is sleeker than the Iron Man 2 version of War Machine and only slightly bulkier than the Mk.42 armor. The shoulder pads are actually hinged this time, which increases the range of movement at the shoulders, but the wrist joints cannot bend upwards due to the armor plates on the back of the hands. 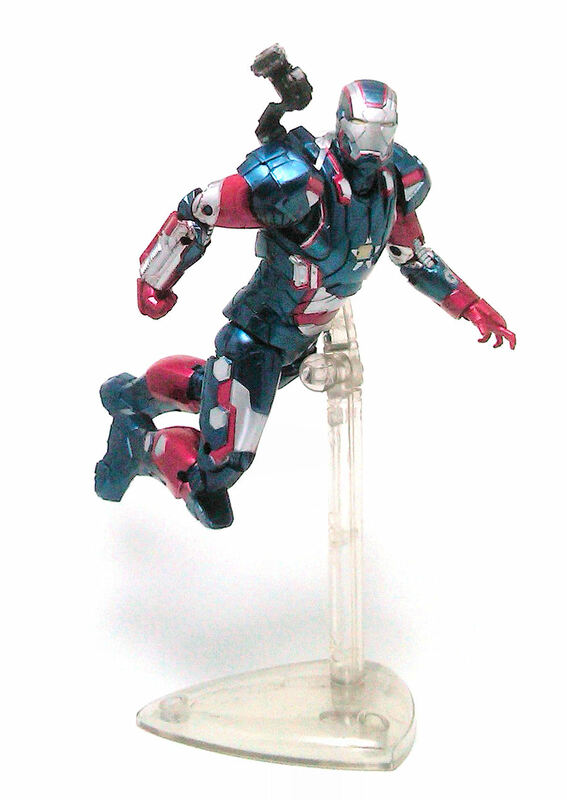 In a similar fashion, the ankles have a rather limited range due to the greave design, but overall, this Iron Patriot remains a fun figure to mess around with. 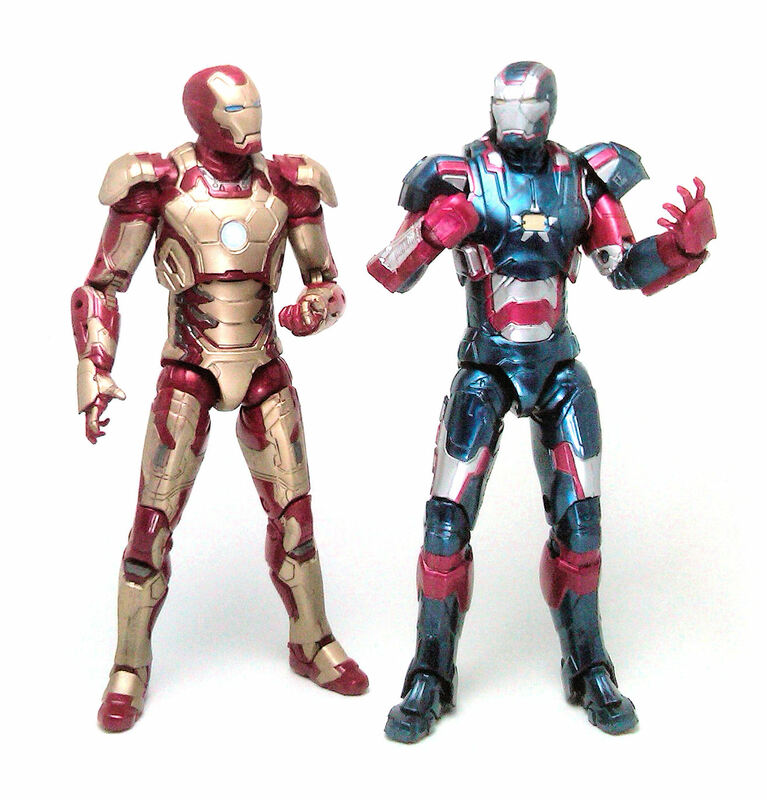 While the paint application on the Mk.42 was just decent, this Iron Patriot looks much better painted, probably because there is a significantly smaller area to paint. 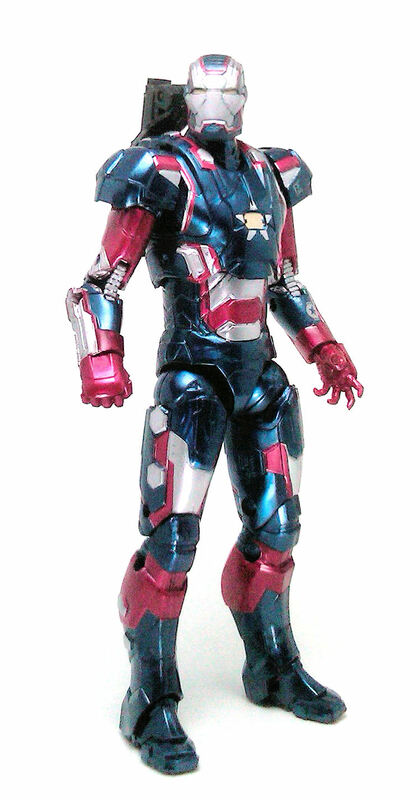 Movie iron Patriot is molded out of blue and red plastic with both materials being the shimmery, metallic-looking kind. Even though the majority of the figure is made from the blue plastic, there are also red paint applications over some of the blue sections that actually match the appearance of the red plastic, producing a very cohesive look. The limbs and torso also sport silver paint applied very neatly onto select panels to complete the Iron Patiot look, as well as small stenciled letters with the name and rank of Rhodey, the USAF star and some other numerals and letters. 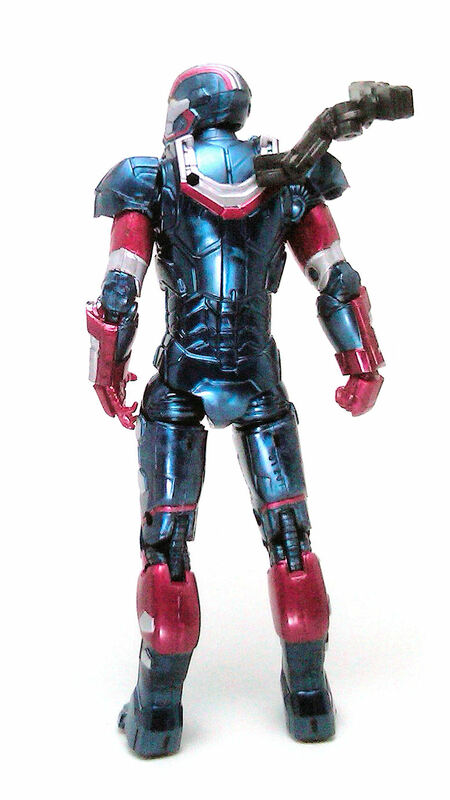 This Iron Patriot suit includes a support assembly for a mini-gun that can be attached to the back of the figure at any of two available ports. The whole piece rotates and has a hinge on top that allows to point the gun in the same direction the figure is looking. Both the weapon and the support arm are made from regular black plastic with no decoration on either of them. Also included is the left arm piece to complete the Iron Monger Build-A-Figure. 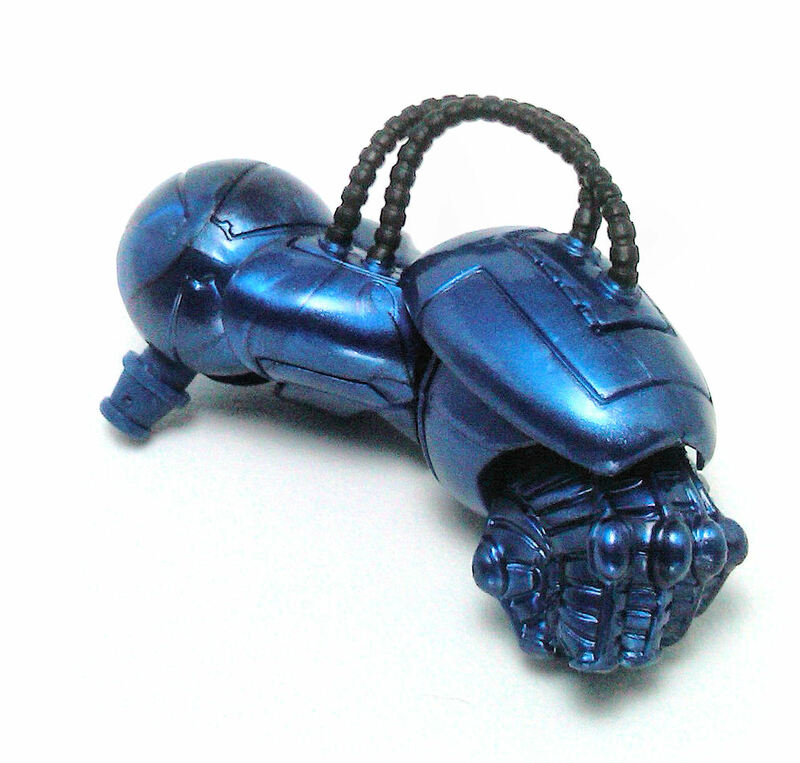 This piece is made entirely of blue shimmery plastic in a lighter hue than that used for the Iron Patriot, with a pair of black hoses connecting the biceps to the outer forearm plate. The armored version of Lieutenant Colonel James Rhodes turned out to be quite a fun, good looking toy. 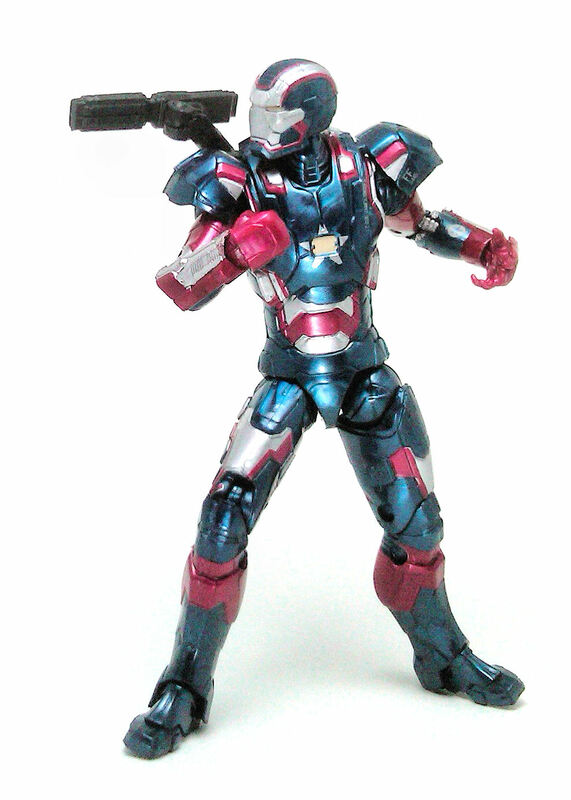 I may still like the Mk.42 armor a little bit better, but this Iron Patriot is certainly a very close second in my book.